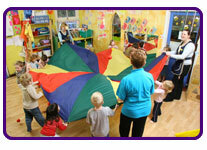 Providing value added service to nursery children and parents. Being linked with the UK's leading provider of Physical Activity with nearly 35 years of experience. Complementing Pre-School setting current provision of physical activity. Leaps & Bounds programme is a skills development programme that underpins the Early Years Foundation Stage in England and Curriculum for Excellence in Scotland. Staff delivering Leaps & Bounds programme, are experienced and assessed by our team of trainers. We actively encourage feedback from Pre-School Settings.